Lest you think I'm normal, let me provide you with yet another example proving otherwise. When my print version of the International Journal of Eating Disorders arrives in the mail, I totally geek out. Last month was no different. I've generally seen most of the articles before, as they are published online before they appear in the print journal, but I like sitting down on my couch with the journal and reading what's new. What struck me about one particular study in last month's journal was not the study itself, but rather a reaction to it on Facebook. The researchers, which included recovering ER physician Suzanne Dooley-Hash, evaluated a series of 942 adolescents (ages 14-20) who showed up in the emergency room for any reason. They were given a computerized questionnaire, which evaluated (among other things) them for the presence of an eating disorder. 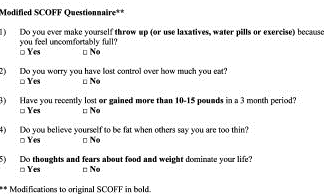 The SCOFF questionnaire is below. Marking yes to 2 or more questions was considered positive for an eating disorder. The researchers also assessed the patients' BMIs, and the presence of tobacco, alcohol, and substance abuse. Interestingly, BMI was associated with the presence of an eating disorder, but maybe not in the way you would expect. The teens with a BMI over 30 were actually most likely to test positive for an eating disorder- they were 3.2 times more likely to show signs of an ED than so-called "normal weight" adolescents. Overall, the researchers found that 16% of the teens shows signs of an ED, and that nearly 30% of those with ED symptoms were male. Frankly, I think those numbers are a little high, as the SCOFF seems to evaluate a lot for disordered eating as much as a clinical eating disorder but that's outside the scope of this blog post. In the "International Journal of Eating Disorders" that came in the mail today I read a fascinating study on the prevelance and correlates of eating disorders among emergency department patients ages 14-20. They found that in a screening of nearly 1,400 patients that 16% screened positive for an eating disorder. That is much higher than the average of .5-1% for AN, 1-3% for BN, and 3-5% for EDNOS typically reported. In addition they found nearly 27% of those screened were male, much higher than the less than 10% typically reported. This supports much of the research we see that ED is on the rise, and that boys and men are just as much at risk. Sad. We have much work to do. Here's the thing: the researchers were screening adolescents who were in the emergency room. This does not mean that that 16% of teens have eating disorders. It means that 16% of patients who were in this particular emergency room answered yes to at least two out of five questions on a survey. Let me repeat: this study does NOT mean that 16% of teens have an eating disorder. Although the author of this comment didn't directly say this, it was sort of implied in the part where they said that "EDs are on the rise." One would likely expect that teens in the ER would be more likely to have an ED given the high levels of physical and psychiatric co-morbidity that they have. My guess is that people with EDs are much more likely to wind up in the ER than people without EDs. As well, teens are at higher risk for EDs and disordered eating, which further explains the high numbers. Nor is this evidence that EDs are on the rise. I don't think there have been previous studies looking at the percentage of adolescents presenting to an ER who have ED signs and symptoms, so it's impossible to say whether these numbers are more or less than before. As well, the current research on the number of EDs in the US or elsewhere isn't all that great, so I'm rather cautious about saying whether EDs are on the rise. My bet is that we are certainly more aware of them, and so people might be more inclined to seek care (or be pushed into care, as the matter might be), but again, that doesn't mean that EDs are more common. When evaluating these statistics, it's important to remember the denominator; that is, the portion of the population that the researchers are surveying. Here, it was adolescents in the ER. I bet you could find 100% prevalence on an inpatient eating disorders unit. We rightly should not be alarmed that so many people have eating disorders if these statistics were surveyed. Well, obviously people being treated for eating disorders almost certainly have an eating disorder. The study is important in that it shows that ER docs can play an important role in identifying EDs. Most of them have their heads too far up their asses to actually do anything about it, but it is good and useful information. I don't like the SCOFF survey (like, at all), but it is quick and dirty, so I understand why they might have used it. Other than that, I think the study is very useful, but we all need to be careful how we interpret and talk about these results. I just skimmed through the article and I think you make very good points. It leaves me wanting to know more about why these teens were in the ER in the first place. Did someone fall and break his wrist? Chances of her having an ED are much lower than someone who came in because she passed out at school. You're right- I was disappointed that they didn't analyze risk of ED vs. reason for visiting the ER. I have visited the ER many times for stuff both related to my ED and not, and they were fairly different. Boy, I've missed you, Carrie. Excellent point! Thank you for making a move to clarify the points some quickly jumped to. And thanks for posting more - you always have something meaningful to say. Anyhow, really interesting blog post :) Where do you find the International Journal of Eating Disorders articles online? Do they have a website? Wow did I miss Carrie research geek-out posts! Excellent point about the sampling bias in this study. From what I understand the stats on ED prevalence in the US are population-wide, too, not restricted to this age range, which also introduces a bias, correct? Another thing that is interesting is that as far as I know, people with lower incomes tend to use emergency rooms more often (except in the case of catastrophic events, of course), and low SES is often correlated to higher obesity rates, so I wonder if that could be behind the trend seen in BMI here...just speculating, not to doubt at all that overweight people struggle with eating issues too, that seems intuitive. Thank you for pointing out that this does not mean that ED's are on the rise. There is so little critical thinking abroad, that what is actually happening is difficult to sort out. Given the biological basis of ED's and the fact that we literally have NO IDEA what (if anything) "triggers" ED's, it doesn't make sense to me that ED's are "on the rise", but rather that our awareness and hence discernment of them, is. But the truth will out, just not necessarily within the time frame we would prefer. Good points to share it thanks for that. research team and disorder treatment center is good work for society.